Find out more about by Great British Bake Off challenge. I fall in love with the bake off a little bit more each week – although when trying to describe the show to others it is hard to explain it’s charm, as it sounds like it must be so boring … watching people bake three types of recipes each week – that’s it really. And obviously not everyone is a fan – in fact, Andrew finds it so incredibly boring he’ll normally hard-wire himself into Netflix each time it comes on (because of course I have to watch it live as it’s essential for my blog … best excuse ever). 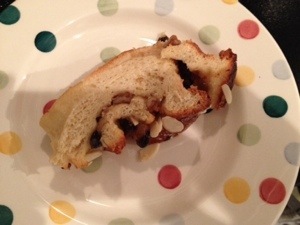 But even he found a few moments of interest this week when the history of Bara Brith was explained. Andrew might in fact be the only Welsh person in the world who doesn’t like Bara Brith. But he perked up at the notion of Torta Negra, the Patagonian version of tea bread which was made by the first Welsh settlers who made Patagonia their home (they still have Welsh accents there, which is very strange, and have names like Juan Carlos Jones). Of course, the main appeal for Andrew is the fact that instead of tea, rum is used to soak the fruit … and in fact, it turned out that rather than eat the cake he’d prefer just to drink the rum straight. 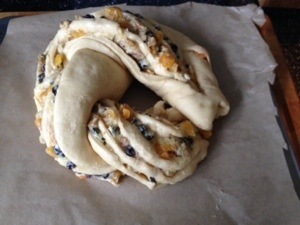 So instead of making torta negra, I instead decided to make the extremely complicated looking apricot couronne. A couronne means ‘crown’ in French, and indicates the shape of the sweet bread when baked. 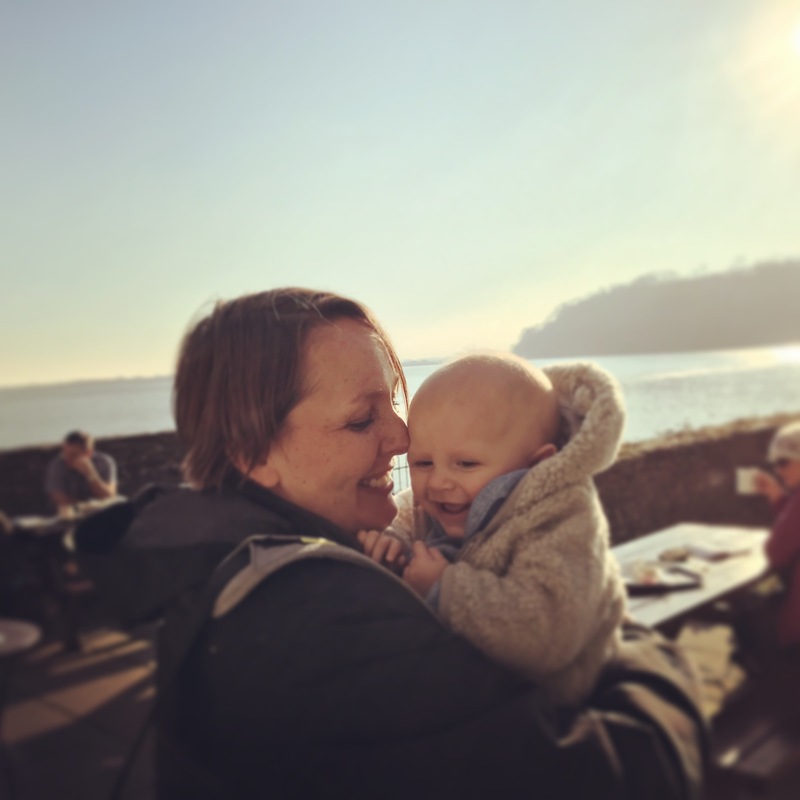 I have never made anything like that and didn’t intend to start now, but then remembered that this GBBO section of the blog is supposed to be all about me challenging myself in the kitchen, so decided I would give it a shot. Of course, the ongoing problem with making all this cakey goodness is that I have to keep eating it (well, I don’t have to, but I am not going to throw it away, so basically there’s not much choice in the matter if I can’t find someone to force feed it to). 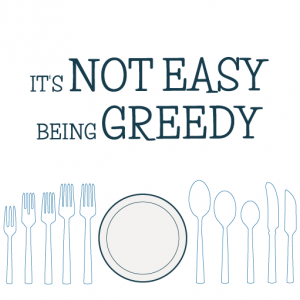 I love eating it all, but cake and sweet bread and pies are not generally Weightwatchers compatible, and so I am not losing weight as quickly as I would like. Luckily (not really) my bosses in Paris decided to book a team meeting for 8am on Monday morning (so kind of them), and so I offered to bring in the couronne for my colleagues as a breakfast treat. Result – no need for me to eat an entire loaf of sweet bread on my own … but problem: I now had the added pressure of having to make something complicated and not ruin it. Oh dear. 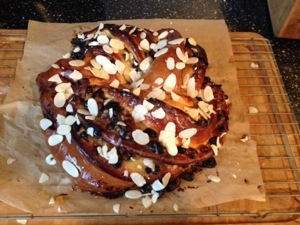 Well, as it turns out, the couronne is remarkably simple to make. The dough is even easier to make if, like me, you have an adored Kitchen Aid which comes with a dough hook – just leave it to do the kneading while you sprinkle extra flour into the bowl when needed. You don’t even need to get your fingers sticky. The filling is even more simple to make – the only real difficulty is not picking at the dried fruit and eating it while you are waiting for the dough to rise. Speaking of waiting for dough to rise, that was the real issue for me – an hour after kneading, my dough was still refusing to bubble up, and I was starting to stress (visions of disappointed and hungry work colleagues staring at me balefully across the conference table loomed in my mind), so I moved the bowl of dough next to a stew which I had bubbling on the hob, and that seemed to do the trick. 2 hours after starting, I finally had a dough which had – just – doubled in size. Phew. So, you roll out the dough into a rectangle (carefully so that it stays springy with air – it is a lovely springy dough), spread it with buttery fruit, roll it, cut it, twist it and make a circle (crown) of it. Leave it to rise again for half an hour or so until when you prod it gently it springs back at you, and then bake it for 30 minutes. Brush with apricot jam, ice (or not), sprinkle with nuts and you’re done. It really was that simple. Apart from one thing – I ran out of icing sugar, so mine had a pathetic dribble of icing on top and that’s it. I can pretend it’s healthy now. There you go, dear colleagues – better than porridge to start your day. Put all of the ingredients for the dough into your trusty kitchen aid, turn it on with the dough hook attachment, and return 10 minutes later to your dough, which should now be smooth and springy to the touch. Grease the bowl so the dough doesn’t stick when rising, cover with clingfilm and leave somewhere warm until it doubles in size (1-2 hours). 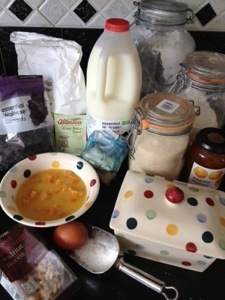 Meanwhile make the filling by mixing all the ingredients together (drain the apricots before adding them). When the dough has risen, roll it out into a rectangle but be gentle because you don’t want to bash all the air out of it. 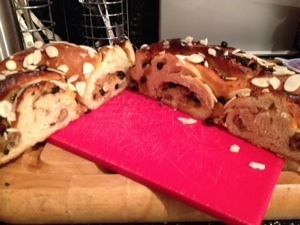 Spread the filling mixture all over the dough and roll it like a swiss roll from the long end. Then cut the long roll down through the middle , splitting it lengthways. Twist the two lengths together and then wrap into a circle shape (a crown!). Put onto a baking sheet and cover with clingfilm and leave to prove for another 30-45 minutes until it springs back when you press the dough gently. Bake in an oven which has been pre-heated to 200 degrees / gas mark 6 for around 30 minutes until golden and risen. Careful because the dried fruit browns quickly and you don’t want it to look burnt (mine did a bit). Cool on a wire rack and glaze with the apricot jam which you have warmed and thinned with a splash of water. Mix the icing sugar with water to make a thin icing to drizzle over the glazed bread (or not, if you run out like I did) and sprinkle with the flaked almonds. Leave to cool and serve – perfect for breakfast alongside a mug of warm coffee. Preferably at home, not at work. 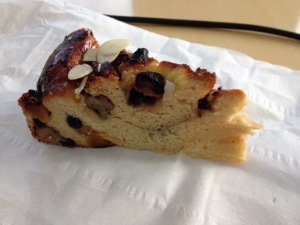 But my lucky colleagues were impressed with my delicious dough – and indeed the entire thing had been munched before midday. I would definitely leave off the icing next time as well – several people commented that it was nice not to have a very sweet pastry, so I of course pretended that had been my intention all along. Shove over Paul Hollywood, there’s a new master baker in town. I think you could freeze it once cooked and cooled but without the icing or nuts (possibly not the glaze either). Let me know if you do freeze it and what it turns out like. I think I’ll have to make another one – so tasty! I hope you make one for your mum to try as am sure she would enjoy it! I am sure I can organise that! Did you give the challenge a try? I am looking forward to tonight’s episode – mmmmmm, choux buns! I know. I get ridiculously excited on Tuesdays! I haven’t given the challenges a go yet but I may well do after seeing how well yours turned out!